In the 1830s, the Dutch Belted cattle were first imported into the United States. There the breed was exhibited as a rare breed of cattle by P.T. Barnum in his traveling circus. The Dutch Belted Cattle Association of America herdbook was established in 1886. The Association still continues today as the oldest continual registry for the breed worldwide. And the breed became well established in the United States and continued in popularity until about 1940. But the total number of the animals declined worldwide to the point of near-extinction during the 1900s. Currently the Dutch Belted cattle are listed as ‘critical’ by the American Livestock Breeds Conservancy on the Conservation Priority list. Today the total population of the breed is estimated at less than 300 in the United States and fewer than 1000 worldwide. 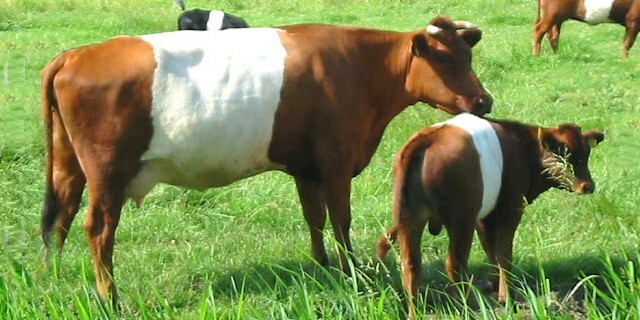 The Dutch Belted cattle are medium sized with belted color pattern. They have base color of either black or dusky red. The black base color is most common. And the most distinguishing characteristic of the breed is the wide belt of white around it’s middle, placed between the shoulders and the hips. Naturally both bulls and cows have horns, and their horns are long and curved slightly upward at the points.